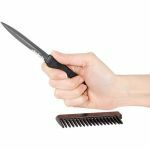 One knife we offer is a pen knife. It looks and works just like a pen but when the end of the pen is pulled off, you expose a 2.13 inch blade you use to protect yourself. 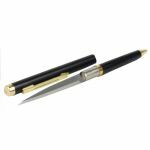 Pen knives are available in gold, black and silver colors.